DESCRIPTION - This listing is for a Roland TD-9 sound module for Roland V-Drums. 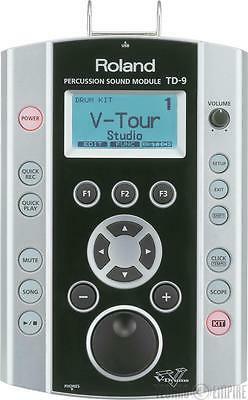 LINK - More info on the TD-9 is available from Roland. ACCESSORIES - Includes original box, owner’s manual, CD-ROM, AC adapter, special connection cable, wing bolt and mounting plate. PHYSICAL CONDITION - New in sealed box! We very much appreciate having your confidence to make a purchase from us and we really want you to be happy. With that, we strive to do whatever it takes to make sure your transaction with us is fully positive. We offer a 100% satisfaction guarantee. For any issues or concerns you may have about your transaction and for fastest service, please use the contact us link above and we will address the situation with priority. All bidders from anywhere in the world are welcome! Before placing a bid please consider that a winning bid constitutes a contract to purchase the item. Please refer to the eBay user agreement or contact us if you have any questions! Qualify any bidders to verify intent to purchase. You must be 18 years of age or oder to bid. 0 feedback bidders please email us before bidding to verify your intent to pay should you win. Special eBay Bid Retraction Rules: Please read eBay’s “Retracting a Bid”. If you place a bid before the last 12-hour period of the auction you may retract that bid before that last 12-hour period but only for exceptional circumstances. You will not be allowed to retract that bid during the last 12-hour period of the auction. If you place a bid during the last 12-hour period of the auction, you will be allowed to retract the bid only under excpetional circumstances as permitted by eBay. For items in which we are an authorized dealer we offer an additional one (1) year to the manufacturer’s stated warranty! We do our best to test each piece of gear and describe it as accurately as possible before listing it. We take lots of detailed photos so that you can make the fairest evaluation of the item’s physical condition using your own skilled observation, independent of our techs qualified, yet subjective, opinion. In the rare case that you receive an item that is not in the condition as shown in the photos or operating as described in the listing, you are welcome to return it for a full refund, credit or exchange for a used item of equivalent value within 15 days of receipt of the item, with free return shipping. We strongly suggest that you check your order after receiving it to be sure that it is in proper working order. Items purchased that are subject to buyer’s remorse or negligence can be returned for a refund within 15 days minus a 15% restocking fee and minus shipping expenses. Items that are listed as “not working”, “for parts”, or “as-is” do not have any warranty or guarantees and cannot be returned for a refund, credit or exchange of any kind. We do our best to fairly evaluate the condition of a non-working item and give an honest description of any symptoms. If there are any further conditions, missing parts, or dead-issues with the item that are not described in this type of listing, Techno Empire will not be held liable for it. Similar to the manufacturers warranty, our one year extended warranty on new items and 15 day warranty on used items covers items when used under normal operating conditions. It does not cover such things as normal wear and tear. It also specifically does not cover items that have been tampered with, altered, modified or where item has been damaged because of buyer negligence. i.e.-Incorrect voltage, un-authorized or self-repair, exposure to extreme temperatures, moisture damage, failure to follow manufacturers instructions or incorrect application etc. Further not covered by our warranty. Acts of god, the old gods and the new gods, forces of nature, product defects (recall type manufacturer issues), unserialized or items with removed serial numbers, ribbon mic elements and mic capsules, consoles, mixers, tape machines, power conditioners or voltage regulators and/or damage resulting from the use or misuse of such items, batteries, tubes, bulbs, losses incurred from loss of business, clients, down-time, profits or for personal inconveniences or expenses in travel, gas etc. loss from theft or loss from loss (you like that one?) control surfaces, speakers, cables and adapters, damage or defects normally covered or still covered by the manufacturers active warranty or 3rd party service plan, use of product for rentals or use by non-owner, losses from corrupted drives or data and losses, theft or damages caused by UFO’s or apparitions, cold spots in the room etc. Please see our RETURNS tab for additional details. We take your privacy and confidentiality seriously. Techno Empire will never sell your confidential information including email addresses and personal information to any other companies. Payments for all auctions are due within 5 business days of listing close unless agreement is made by us via email to extend deadline. All listings not paid by the morning of the 5th business day will be re-listed or sold and previous auction(s) voided. California residents pay 9% sales tax. California law requires the collection of taxes for any item picked up and/or paid for within the state of California. This is regardless of whether it is cash, PayPal or credit. PayPal is our standard accepted means of payment. We accept PayPal payments made from a verified PayPal account. The confirmed shipping address on the PayPal account must match the shipping address of the order. We also accept all major credit cards. Our credit card processing is 100% secure and your privacy is very much respected and kept discreet. Domestic and International credit card transactions go through a comprehensive fraud prevention algorithm and check-list that is the best money can buy. All transactions are 100% secured with 128-bit encryption. Cash payment for local pick-up is always welcome! Brand NEW items for which we are an authorized dealer ship for FREE within the contiguous United States! USED items are subject to standard shipping charges as calculated for that individual item. All orders are handled within 1 business day of cleared payment. In the unusual circumstance that it takes longer, we will notify you with an email. Some larger items and freight shipments take longer than one day to process. USPS and FedEx Ground are our standard choice for shipments made in the Continental US and Canada. USPS is our standard method for all shipments made to Hawaii, Alaska, US territories and Military APO addresses. Additional shipping fees may apply to these areas, please inquire. Techno Empire does ship FREIGHT and can accommodate the crating and palletizing of most any size item. Please inquire for a special quote. Know that extra time is needed in preparing freight shipments. Express or overnight delivery on items is available upon request at an additional expense. All shipments are insured for their sale amount. Direct signature on packages is an option. If desired, please request signature delivery prior to shipment. Packages lost due to theft or loss are not the responsibility of Techno Empire Inc. Examine all boxes upon receipt by the carrier before acceptance. Carrier must note any damage to the box on a release form or you can refuse acceptance. Any items that you receive that have exterior damage to the box or damage to the item, or missing parts or accessories, please report this immediately to customer service at Techno Empire. Please keep all packing materials, accessories and merchandise tags for any item you want to report a claim. Techno Empire will not be responsible for denied insurance claims if any of the above terms are not met. Local pickup in Burbank is always free and welcome. Please contact us to coordinate a time that is good for you. USPS Priority is our standard method for most shipments made Internationally. Express services are available for faster delivery at buyers expense. Please inquire before purchasing. FedEx Express and DHL are available for International packages exceeding USPS size limits for certain countries. Please inquire for rates if you do not get a rate from the calculator. All orders are shipped within 2 business days of receipt of cleared payment. In the unusual circumstance that it takes longer, we will notify you with an email. Import duties, tax charges, or any other destination fees besides direct shipping costs are not included in the product price or shipping charges. Import duties and taxes are the sole responsibility of the buyer. Please check with your country’s customs office to determine what these additional costs will be prior to bidding or buying. For International shipments, we cannot mark items as “GIFTS”, they will be marked as “Merchandise”. Insurance for the item will be based on the declared value of the item. No insurance claims will be made exceeding the value declared. Techno Empire will not be responsible for any packages that are lost, stolen, or damaged in International transit. Items that are un-collected from customs and returned to us are subject to a 15% restocking fee and no refund will be given on shipping charges. Specific shipping requests must be written in the “notes” section of the PayPal payment. Techno Empire can ship Sea or Air Cargo on very large and oversize items and can accommodate the crating and palletizing of most any items we carry. Please inquire for a special quote. Know that extra time is needed in preparing freight shipments. If you are not completely happy with a new item that you have purchased, you can return it within 30 days of receipt. Returns on new items are subject to restocking fees if qualifications are not met (see qualifications below). Return shipping costs for new items are the responsibility of the buyer. Shipping and insurance costs are non-refundable. New items that are defective within 30 days of receipt can be returned for replacement, store credit or full refund. In this case we provide return shipping at our expense. Techno Empire will not reimburse customs, taxes or any other related fees or expenses for any returns. Regardless of any misrepresentations made or perceived to be made by Techno Empire. Returns have to be processed through several departments. Please understand that it takes 3-5 business days to complete your refund after receipt of the returned item. All new item returns must include everything that came with the original purchase and be in new condition. This includes all accessories, manuals, software, warranty cards, etc. and all original manufacturer packaging in NEW condition. Any item returned with missing or worn packaging, accessories or wear, damage, stains, defects, imperfections, smoke or pet odors or signs of use that make the item less than new are subject to reasonable devaluation fees to be deducted from the refund amount. All new item returns must receive an RMA number from us before it can be accepted for return. Return item must be repackaged for safe return with the same care and expertise in which you received it. Return items must be insured for at least the value of the item. Any losses incurred because of inadequate insurance will be subject to fees charged against the refund. When you receive the item, please don’t tear into it like a heavily-caffeinated seven year old Edward Scissorhands on Christmas morning. Be mindful to open the package carefully using a sharp box cutter and observing not to tear up the sealed internal packaging also. For instance, if it is rack gear, we would recommend avoiding racking it until you were certain it was a “keeper”. Thus preventing any possible “rack rash” or scratches. Although tempting, put down the extra sauce and cheese deep dish pizza that is dripping all over your leather vest and beard and be sure your hands are clean and dry before trying out your awesome new gear. Pet odors, cigarette and other smoke items can also affect the “newness” of your gear. Also, keep the gear away from your friend with the Billy Ray Cyrus mullet driving the Camaro. He’s a good guy and he means well, but years of smoke tar and beer bongs have dulled his perceptions. So please use common sense and think in terms of preservation of the item until you are certain you are keeping it. Observation and application of these tips will help you avoid any restocking fees on new item returns. We do our best to test each piece of gear and describe it as accurately as possible before listing it. We take lots of detailed photos so you can make the fairest evaluation of the item’s physical condition using your own skilled observation; independent of our techs qualified, yet subjective, opinion. If you are unsure about the condition of any item, or need clarification, you are more than welcome to contact us to request more data or specific photos to satisfy any questions you might have. In the rare case that you receive an item that is not in the condition as shown in the photos or operating as described in the listing, you are welcome to return it for a full refund, store credit or exchange for a used item of equivalent value within 15 days of your receipt of the item, with free return shipping. We strongly suggest that you check your order after receiving it to be sure that it is in proper working order. Items purchased that are subject to buyers remorse or negligence can be returned for a refund within 15 days minus a minimal 15% restocking fee and minus shipping expenses. Items returned damaged, altered or in any way less than the condition you received it are the responsibility of the buyer. Devaluation from damages, costs of repairs or loss of value will be deducted from the refund in addition to the restocking fee. Items returned due to assumed defects because of buyer negligence, but found to be actually working or as described in the listing are subject to a 15% restocking fee and no refund on shipping expenses. For example, if you returned a guitar pedal or microphone because “it is not working”, but it was found that you simply had plugged it in wrong. In this case, we will be glad to send the item back to you with instructions on correct usage, at your further expense for shipping. All refunds have to go through several departments. Please allow 3-5 business days processing after we receive the item, before your refund, credit or exchange is issued. Items that have been tampered with, altered, modified or where item has been damaged because of buyer negligence, i.e., incorrect voltage, self-repair, exposure to extreme temperatures, moisture damage, or incorrect application, etc. Earphones, microphones or other items that have intimate mouth, face or body contact. Software, computer hardware, computer drives and other digital or media tape. Items which are special orders, discontinued, close-outs, or “as-is” items are all non-returnable. New and used items are subject to a 5% processing fee if cancelled before delivery. Please contact customer service at our “contact us” link above so we can send you an RMA number and helpful return instructions. Prior authorization is required. All refunds have to go through several departments, once the item is received by us, so please allow 3-5 business days processing before your refund, credit or exchange is issued. Replacement Foam Windscreen for K&K Sound Silver Bullet Clip-on Microphone, NEW!